** Please note:** This is an inductive buzzer meaning that is will act as a short to ground if you are not actively driving it. 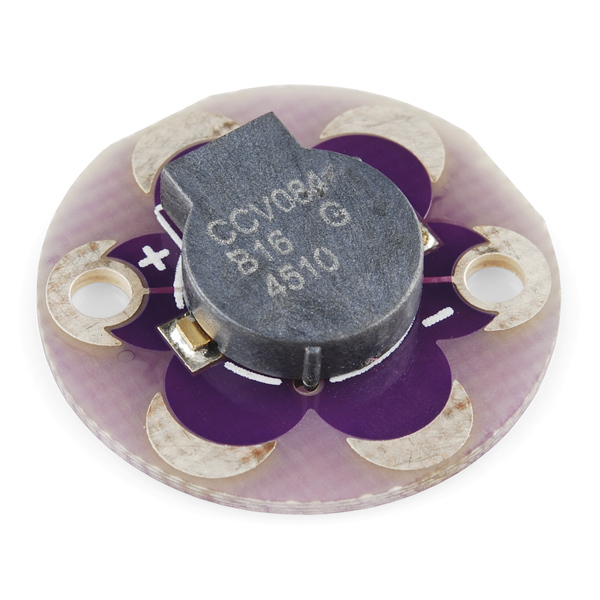 We recommend you put both I/O pins to low (0V) when the buzzer is not used. Also, it's come to our attention that washing these buzzers will damage them. Until we've figured out a solution to this, avoid washing any portion of your project that contains one of these buzzers. 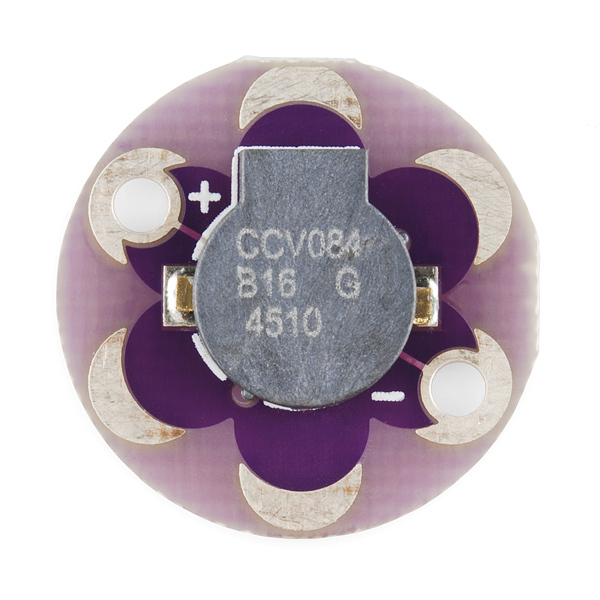 How about a snap version that you can modify to remove from the circuit when the wearable needs to be laundered? 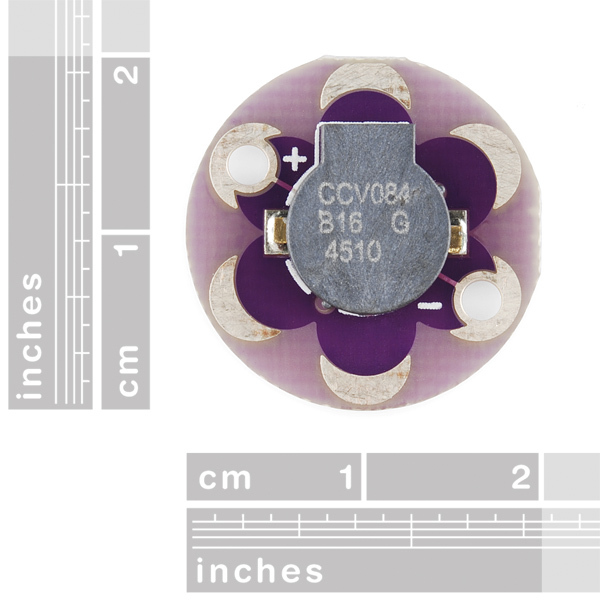 I added support of this part to the Fritzing custom libary. Is it possible to program this speaker to say words only using the tone commands that would create notes? I am fairly new to programming and I do not fully understands the limitations of what i can do with a simple speaker like this. Has anyone actually used 2 I/O lines at different frequencies to drive this buzzer or just 1 I/O line and ground? Is it possible to get higher volume using 2 I/O lines instead of 1+ground? Is this item washable or not? The note says they are not washable then later it says they are. Would you please remove the part of the description that is inaccurate. Could Sparkfun stock that buzzer please? Link to the Datasheet isn't working. I'd like to know how much power it draws (maybe also say in the main product description)? How do we interface to it to get it to make sound? Thank you. I have order some of them. So i need until they arrive to know the following please. could you please give us a schematic example? Could you please give us its datasheet? Could you please show us the voltage range and the transtistor driver? 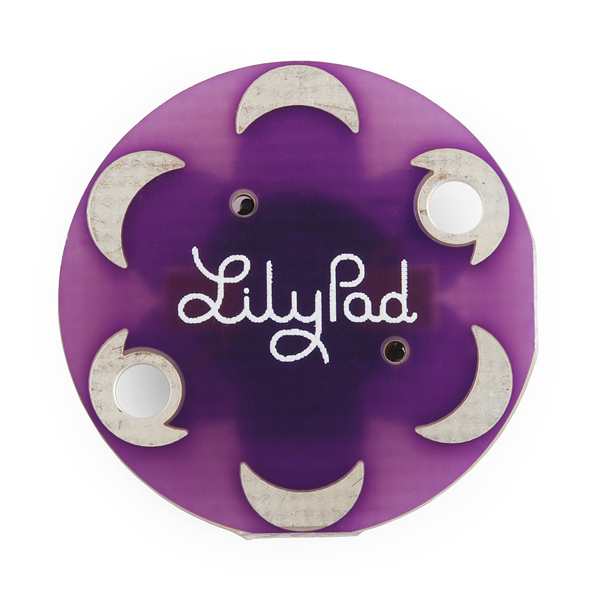 Could you add the LilyPad Simple Board to the All LilyPad Product Sticker Sheet?